The Building Bridges programme supports people across Swindon and Wiltshire who are facing significant challenges in being able to develop their skills, access education or move towards the world of work. Taking part in the programme is entirely voluntary and all of our advice and support is offered free of charge. 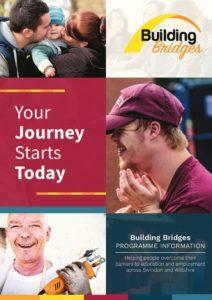 The Building Bridges programme is a partnership of local organisations who are experts at supporting people and giving them the skills and confidence they need to move forward. We work with people on a one-to-one basis to help them address the challenges and barriers they are facing and develop a personalised plan to help them achieve their goals at a pace they are comfortable with. Each participant will have someone who works with them as a mentor, helping them to access support from across the partnership. These mentors can also work with family members, carers, key workers or other people supporting you if you give us permission – it is entirely up to you. We understand that there are many different factors which affect whether people feel ready to take the next step forwards – this is why we also offer specialist help and support in a number of areas including developing physical and mental wellbeing, accessing debt and financial advice and help with issues such as transport and childcare. The programme is jointly funded by the Big Lottery Fund and the European Social Fund. You can find out more about the Building Bridges programme and our funding and programme partners by visiting the Building Bridges website.